This is the time of year I start making hot drinks and there is so much more diversity in those. There’s only so much you can do with iced coffee drinks. Sure, we love our iced press, iced lattes, and this summer I introduced what we came to call an Iceless (first drink pic on my coffee page), but that’s about it. Ah, but hot drinks. Now, there’s variety. I start making peppermint mochas during Christmas, then, when January starts, I start doing weekly(ish) specials. A time to brush up on all those recipes and learn some new ones. 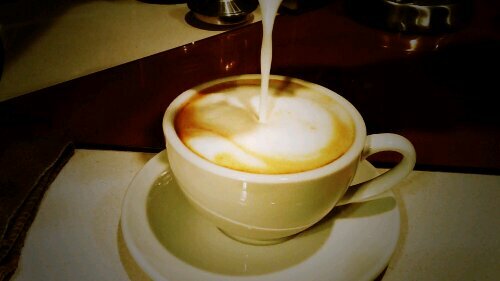 It’s a foamier drink than a latte, with a thick layer on top but leaving the underlying milk fairly dense. Equal parts coffee and steamed milk. I make it with press as well but our dear friend Jennifer gave us some Lavatzza Classico for Christmas, so that’s reason enough to make the moka pot I got for Christmas last year the first thing I dust off for the winter. In the coming weeks, I’ll be making all those drinks you see on the home page I made for my home cafe and many more, as well as others I’ll learn as we go. So, stop by and try something. Lately, we’re home and ready for guests every Monday. Any other day just give me a little notice before you drop by. This entry was posted in daily recap, Uncategorized and tagged coffee geek, guests, home cafe by ABQChristopher.Bookmark the permalink.